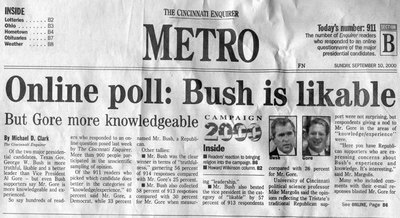 I was at my parents’ house yesterday and saw this old Cincinnati Enquirer covering the 2000 election. For all of you who just “like” Palin and will vote McCain/Palin just because of her, just remember what these last 8 years have been like when we’ve voted for someone “likable”. I would rather not have to say “I told you so” eight years from now. Again. In an ironic twist of fate, I voted for Gore the first time. Clinton before him. It’s not about being a dem or a republican. It’s about voting for what you believe in. My value systems have changed over the past years when I got married and had children of my own. My reasons for not wanting to vote for Obama go way past political issues. Re: My reasons for not wanting to vote for Obama go way past political issues. That’s pretty obvious. And hopefully not the way it sounds. If you’re inclining race then I am VERY disappointed in you. You know me better than that and I find it sad that you would even consider that with me. I thought you knew me better than that. I do not like Rev. Wright and what he stands for. Plain and simple. That would be one of my many reasons. I think that plays into the character of Sen. Obama. You can say what you want but if someone is your spirital leader for 20 years, those tides do not turn overnight. There are other issues but I don’t even care to explain them to you at this point. You obviously have in your mind what you’re going to think. And, now I have mine. I don’t think you’re racist or I wouldn’t associate with you. But read what you wrote! Your statements and reasons could be construed as such by people who read them here in this blog. Even though you and I are the only ones who seem to comment, several hundred people do actually read my blog a day. And I have gotten questions about who you are since it’s pretty obvious that I know you. My problem with Rev. Wright is that he thinks the world was made in 7 days. But, does that affect policy? Not really.